HE came, he saw, he played the drums – the incoming headteacher of William Ellis School in Parliament Hill made his first public appearance at a garden fete on Saturday afternoon. Robbie Cathcart, who will take over at the boys’ school in Highgate Road later this year, turned up at the fun-filled summer fundraiser. One of his top priorities when he gets behind his desk at the school will be to turn around its finances, which were recently £500,000 in the red. The stresses and strains of that challenge were forgotten – for an afternoon at least – as students, teachers and parents enjoyed the sunshine and the usual mix of face-painting and cake stalls. 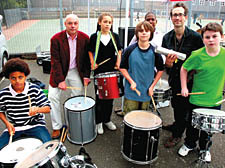 As a graduate of the Royal Academy of Music, Mr Cathcart, a highly regarded headteacher who joins from a school in Redbridge, north-east London, is no stranger to musical instruments – although his CV says he specialised in piano and viola, rather than percussion.